Thomas Warren : Dust and Foam in Hawaii, 1859. 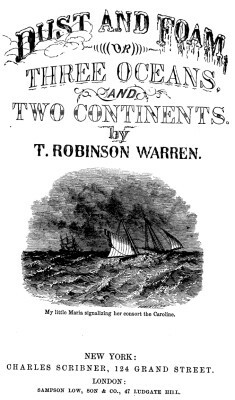 Dust and foam; or, Three Oceans and Two Continents. C. Scribner, New York, 1859. Every man, woman or child who has ever written home concerning the Sandwich Islanders, have described their "surfboards," and their astonishing skill in guiding them through a surf in which no civilized man could live, as also their excellence in swimming, and almost superhuman endurance in the water. Travellers are apt to term a Kanaka " half man half fish." I should say that he was " third man and two-thirds fish "- for no fish that swims the ocean could have any command over itself in breakers where the island girls and boys sport for hours, as perfectly at home as on the dry land. The surf-board is a piece of thin plank, five or six feet long by about eighteen inches in breadth; when the long, green swells are rolling in with terrific violence - with a din and crash that out-thunders thunder itself, then men, women, and children flock to the beach, and divesting themselves of their superfluous clothing, dash into the breakers, board in hand; with a miraculous agility they dodge the heaviest rollers, plunging beneath them as they begin to crest, and reaching the outside breaker, prepare for their lightning ride shoreward. which no whale-boat would attempt, seemed to us, setting the force of suction and undertow completely at defiance, we felt a thrill of horror as we looked upon a couple of delicate-looking girls kneeling upon a frail board, rushing in, as if shot from a bomb, upon the crest of a great, green billow, which, raising his head as he came, appeared like a huge mountain of water; onward they came, just managing to keep in such a position as to avoid the break of the roller, and in less time than I have taken to describe, with screams of delight they dashed up to the very spot where we were standing. A report of a party of natives forced to swim for four hours to reach land after their canoe sunk, the one white member of the party did not survive. as perfectly at home as on dry land. ing their engagement.— Dust and Foam. Geoff Cater (2007-2017) : Thomas Warren : Dust and Foam in Hawaii, 1859.